Delivery may take up to 10 days. Comprehensive Inorganic Chemistry II reviews and examines topics of relevance to today’s inorganic chemists. Covering more interdisciplinary and high impact areas, Comprehensive Inorganic Chemistry II includes biological inorganic chemistry, solid state chemistry, materials chemistry, and nanoscience. The work is designed to follow on, with a different viewpoint and format, from our 1973 work, Comprehensive Inorganic Chemistry, edited by Bailar, Emeléus, Nyholm, and Trotman-Dickenson, which has received over 2,000 citations. The new work will also complement other recent Elsevier works in this area, Comprehensive Coordination Chemistry and Comprehensive Organometallic Chemistry, to form a trio of works covering the whole of modern inorganic chemistry. 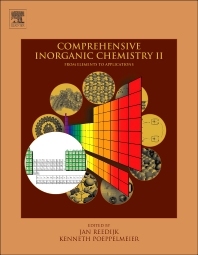 Chapters are designed to provide a valuable, long-standing scientific resource for both advanced students new to an area and researchers who need further background or answers to a particular problem on the elements, their compounds, or applications. Chapters are written by teams of leading experts, under the guidance of the Volume Editors and the Editors-in-Chief. The articles are written at a level that allows undergraduate students to understand the material, while providing active researchers with a ready reference resource for information in the field. The chapters will not provide basic data on the elements, which is available from many sources (and the original work), but instead concentrate on applications of the elements and their compounds. Jan Reedijk is emeritus Professor of Chemistry at Leiden University and part-time professor of Chemistry at King Saud University Riyadh. He has authored and co-authored over 1100 research papers in molecular inorganic chemistry areas, like coordination chemistry, biomimetic chemistry, anticancer metal compounds and homogeneous catalysis. His work has been honored by a Max Planck Award, and a Royal Knighthood to the order of the Dutch Lion. He is also an elected Member of the Royal Netherland Academy of Sciences, the Academia Europaea and the Finnish Academy of Sciences. He has been a founding editor of the European Journal of Inorganic Chemistry, and still belongs to the editorial board of a number of scientific journals. He has been the Executive Secretary of the International Conferences on Coordination Chemistry (1988-2012), and served as chair or on organizing committees of many other international conferences. He is President-elect of the inorganic Chemistry Division of the International Union of Pure and Applied Chemistry (IUPAC) and has been serving on several IUPAC Committees. He has also been and is still active in a number of European COST actions in Chemistry. For the Royal Netherlands Chemical Society he acted as vice-president and president, and he has also served on the Netherlands Foundation of Chemical Research. During his career he spent sabbatical periods in Cambridge, Strasbourg, Louvain, Münster, Dunedin and Torun. He has been the Director of the Leiden Institute of Chemistry from 1993-2005. Kenneth Poeppelmeier studied chemistry at the University of Missouri-Columbia from 1967 to 1971 (B.S. Chemistry). From 1971 to 1974, he was an Instructor in Chemistry at Samoa College in Western Samoa as a United States Peace Corps volunteer. He joined the research group of John Corbett at Iowa State University after leaving the Peace Corps and received his Ph.D. in 1978. He then joined the research staff of Exxon Research and Engineering Company, Corporate Research Science Laboratory, where he worked with John Longo and Allan Jacobson on the synthesis and characterization of mixed metal oxides and their application in heterogeneous catalysis. He joined the chemistry faculty of Northwestern University in 1984 where he is now the Charles E. and Emma H. Morrison Professor of Chemistry and, currently, the Director of the Center for Catalysis and Surface Science (CCSS) at Northwestern University. He also serves as the Associate Division Director for Science in the Chemical Sciences and Engineering Division at Argonne National Laboratory. Professor Poeppelmeier has published over 300 research papers and supervised approximately 100 Ph.D. and PD students in the area of inorganic and solid state chemistry. Professor Poeppelmeier has been an associate editor for the American Chemical Society journal Inorganic Chemistry for over 20 years and has served on the editorial boards of several journals in his field, including the Journal of Alloys and Compounds, CHEMtracks, Chemistry of Materials, Journal of Solid State Chemistry, and Journal of Solid State Sciences. He is a Fellow of the American Association for the Advancement of Science (AAAS) and Japan Society for the Promotion of Science (JSPS) and has been a Lecturer for the National Science Council of Taiwan (1991), Natural Science Foundation of China (1999) and Chemistry Week in China ( 2004), Institut Universitaire de France Professor ( 2003), Visitantes Distinguidos Universid Complutenses Madrid (2009), and more recently was awarded a Visiting Professorship from the Chinese Academy of Sciences (2011).